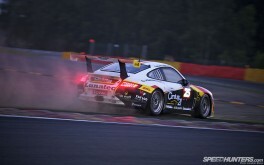 The storm of activity on the track on Thursday was followed by a real storm on Friday that led to the cancellation of the planned Super Pole session. Rather than the one-by-one, driver-against-the-clock format, this meant that the combined result from the two main Qualifying sessions would be used to set the grid for Saturday’s 4pm start. We’ve now moved into the relative quiet before the build-up to the race: the 66 cars are now tucked up their respective pits receiving the final mechanical TLC ahead of the 4pm race start tomorrow. 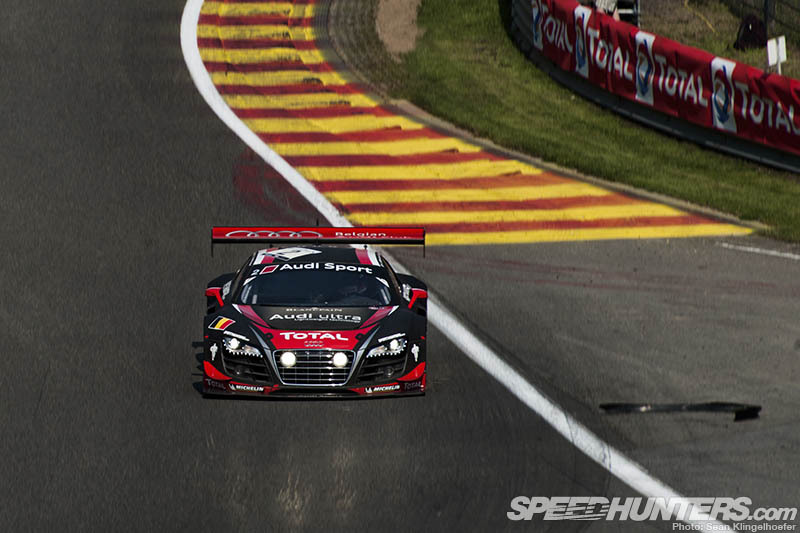 The WRT team are part of the factory Audi effort here, along with the sister Phoenix team: Dr Wolfgang Ullrich, head of Audi’s motorsport programmes, is present at Spa to direct operations against the massed ranks of the opposition. 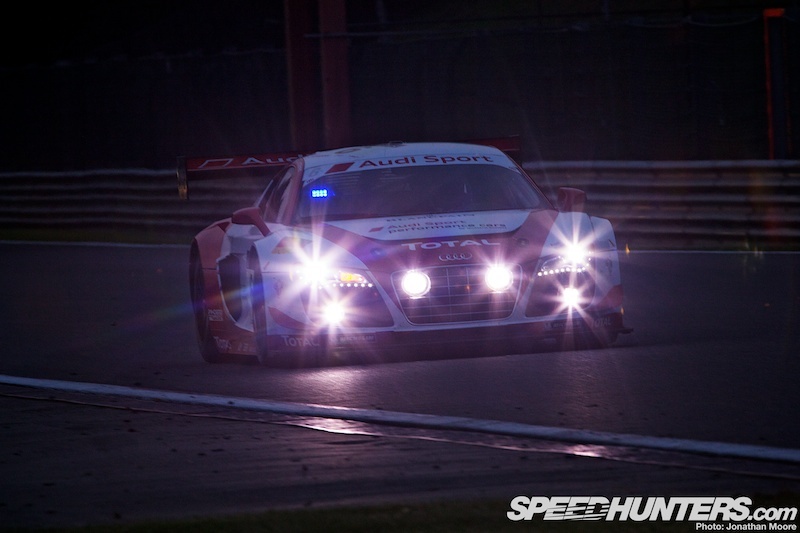 Team boss Vincent Vosse piloted one of their Audi R8 LMS Ultras down the country roads between the track and the town of Spa for the driver parade with a very young potential driver strapped into the make-do passenger seat. That must have been quite a ride! 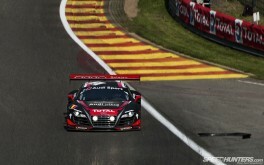 WRT are set up within the Audi compound, a purpose-built area surrounding the pit boxes for the two factory teams. Inside the pits themselves they’ve set up their own garage-wthin-a-garage.You can follow the team throughout the weekend on WRT’s YouTube channel. With all the introductions and set-up complete, it was time to get out on track for the first time. 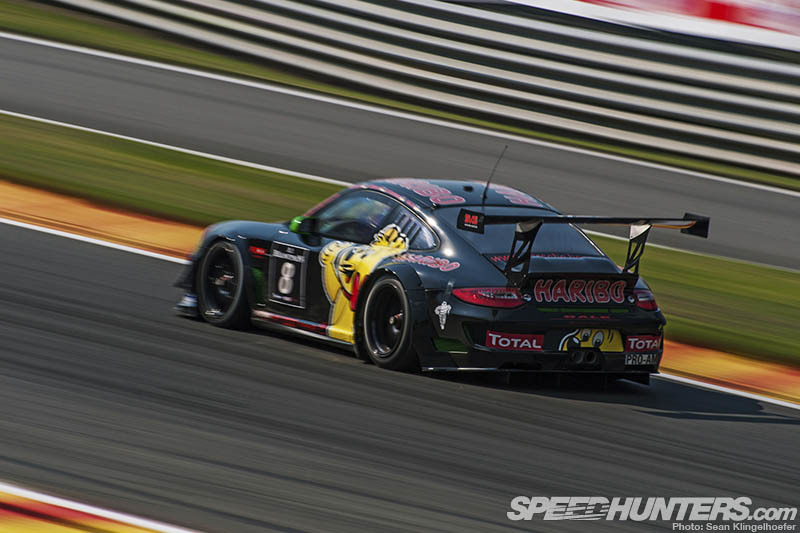 As predicted, right from the opening Free Practice session on Thursday morning the Pro and Pro-Am cars were mixing it up, and the Haribo Racing Team Porsche topped the time sheets with a 2:21.168s lap time at the end of the hour and a half session. 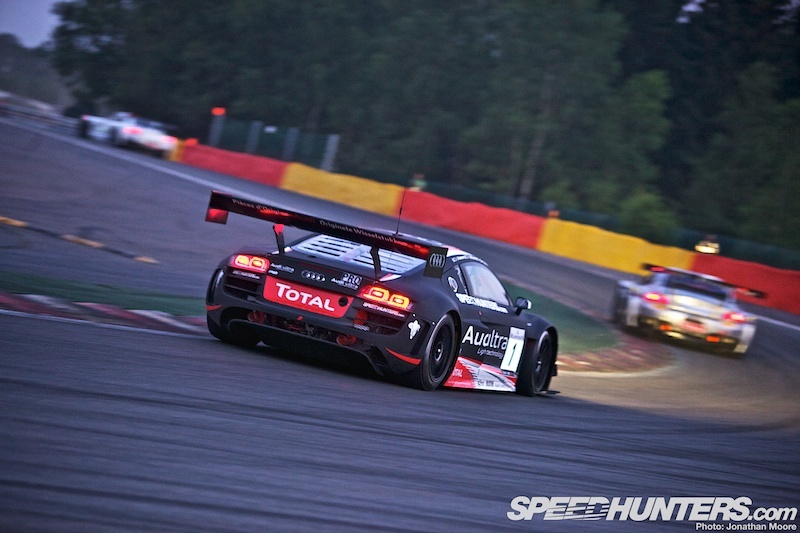 Behind them were another four Pro-Am cars before the first fully Pro car, the #6 Audi Sport Team Phoenix featuring Tom Kristensen, back in sixth with a 2:22.769s lap. Things seemed nicely mixed up at this stage: a Porsche leading from two Ferraris, a second Porsche, a McLaren, two Audis, another Porsche and then a BMW, with the fastest Mercedes in 13th. Already there were casualties. 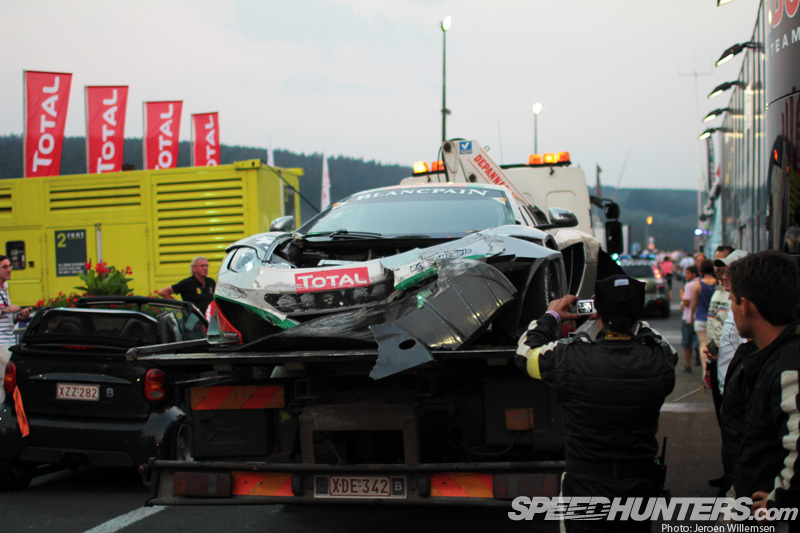 As we saw in Sean’s post, the #71 Kessel Ferrari 458 smashed into the retaining wall at Eau Rouge. The team worked hard through the main part of the day whilst the supporting races were out on track and managed to repair the damage in time for qualifying. 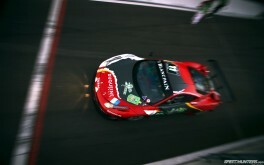 At 6.20pm, the hour of Pre-Qualifying kicked off. In typically obtuse Spa style, the weather had been glorious all day: in balmy sunshine the cars went out as early as possible to get out on track and maximise the available time. 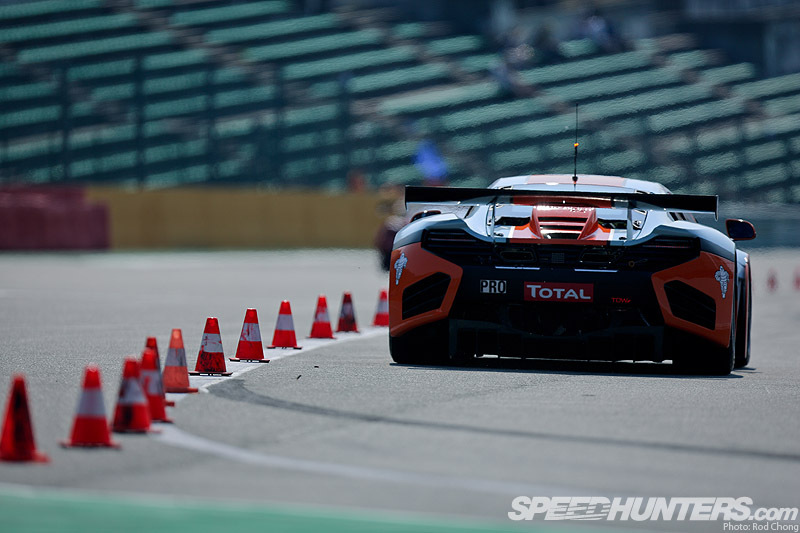 Things got shaken up again and this time it was a McLaren leading the pack: the #88 Von Ryan Racing MP4-12C, heading a second McLaren. 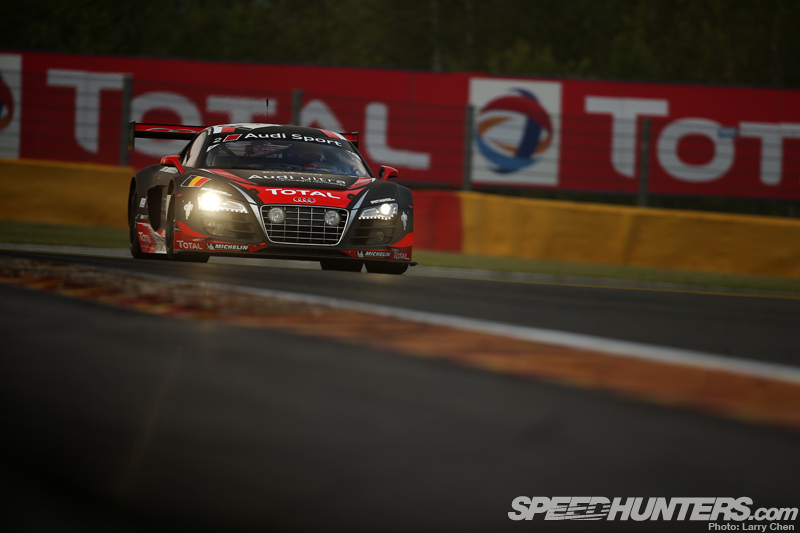 The great news for WRT was that Edward Sandström in the #2 Audi held the top spot for a large portion of the session, only to be passed by the two McLarens towards the end. 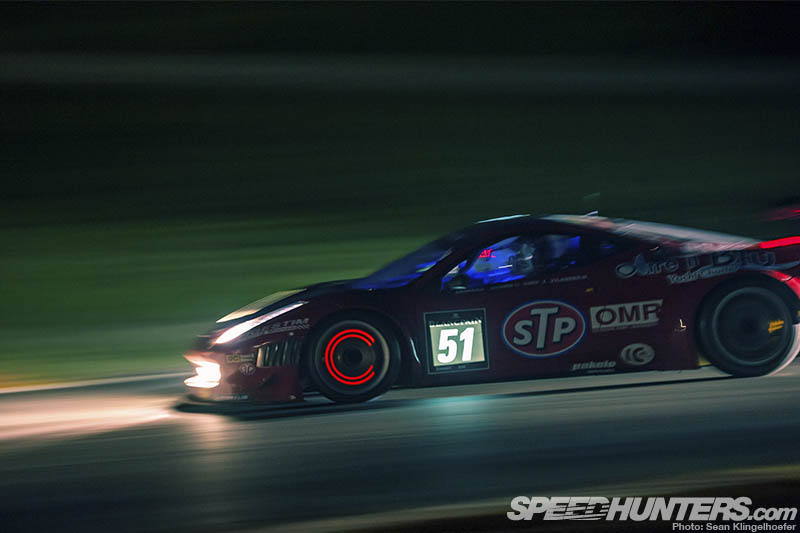 Qualifying for the 24 Hours was split up across two sessions of an hour and a quarter each, one in the late evening and then the final part starting in darkness. These two sessions were originally scheduled to be followed by the Super Pole shoot-out on Friday between the top 20 cars, but the session ended up being cancelled when a big storm hit the track an hour before the session was due to start – this meant that a number of teams probably didn’t push as hard as they would have done, knowing that they were safely in the top 20. 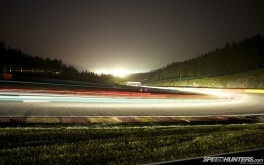 I decided to scout the inside line of Eau Rouge. There are plenty of different angles to find, both on the inside and outside. 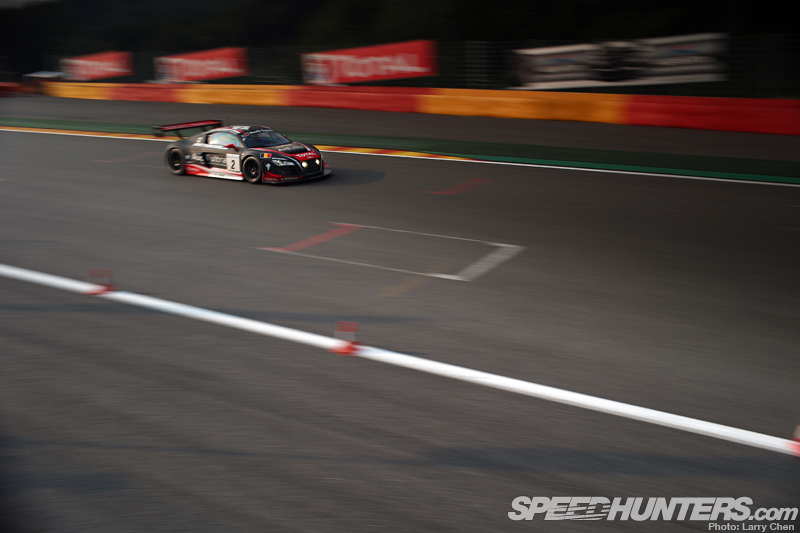 Although you can get closer on the outside on the Radillon apex, standing at the bottom of the old endurance pits (pressed into service this weekend because there are so many cars) allows you to keep an eye on the pit activity whilst also watching the cars head for the sky at Eau Rouge. 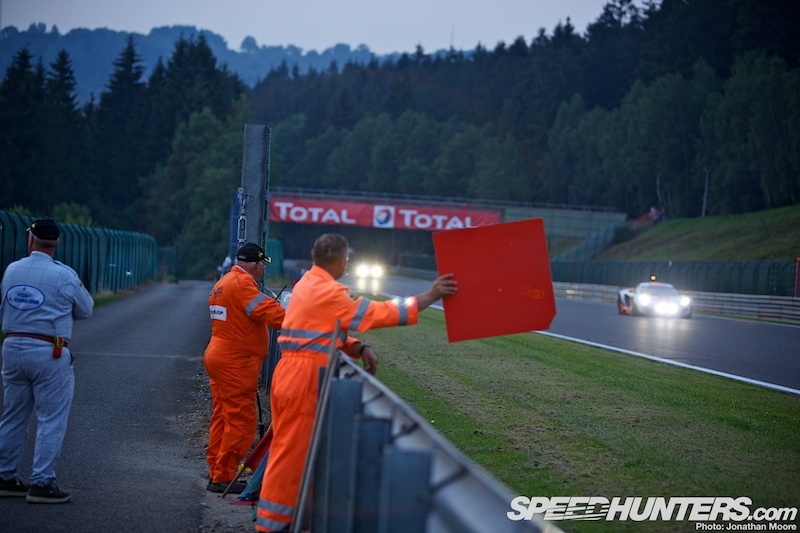 Right at the bottom of the pit-lane you can scan across the track as the cars hit the lowest point of the corner: sparks fly and dust is thrown up as the cars grind their way up and over Eau Rouge. 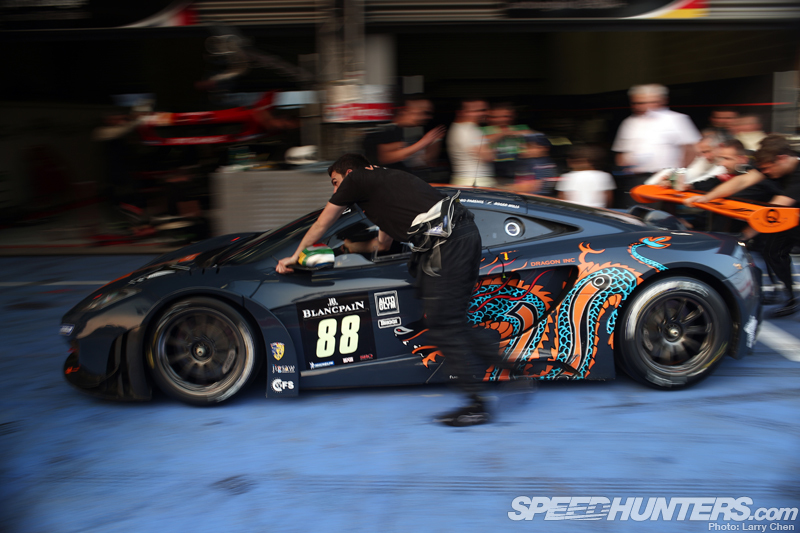 It’s a mind-boggling combination of cars moving so fast uphill that your eyes have trouble following them at the same time as hearing the sound of the cars shaving off bodywork – which you can even hear over the engines. The classic shots from the outside require a hike up the hill to get to the photographers’ trenches behind the barriers, and it was no easier on the other side. The first available entrance was a way up the Kemmel Straight, through that still allowed a good view as the cars blasted up to Les Combes. The cars are going shockingly fast here. 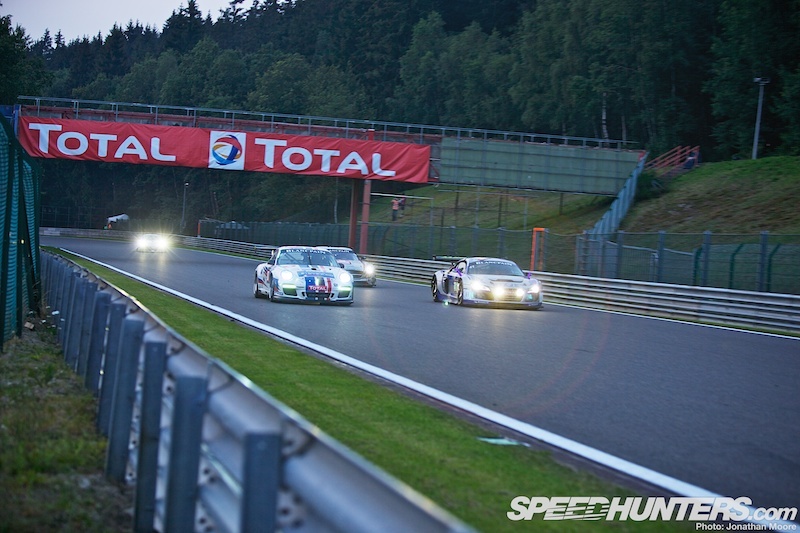 The best thing about GT3 cars is that don’t lack power – drag is their biggest problem, but that doesn’t seem to affect how fast they look at Spa. 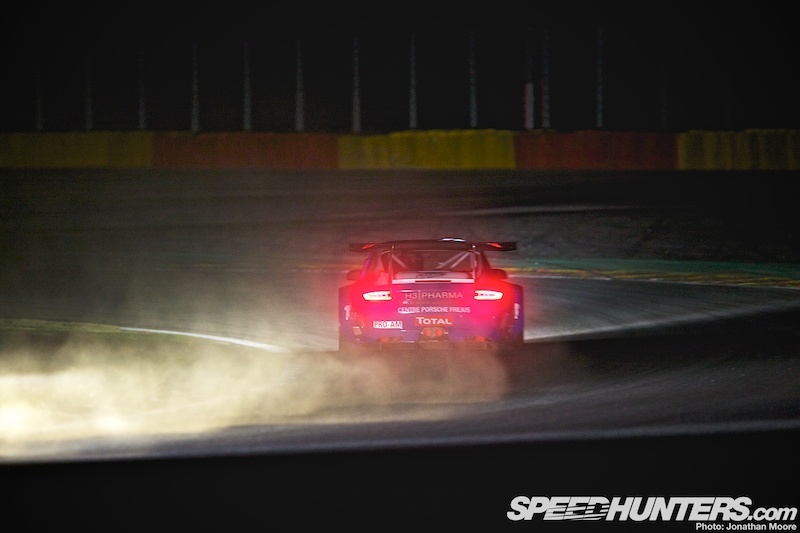 With the recent shock of hot weather the usual Belgian mud has dried out, creating a mini-dust storm at each corner as the cars cut further and further across the kerbs. 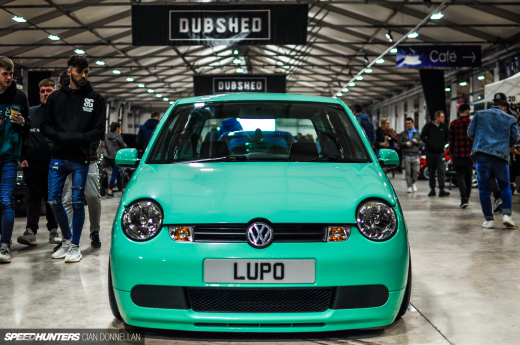 …let alone face-on flashes from over enthusiastic-photographers. But with half an hour still to go in Q1 the red flags were out following a big crash for the Portuguese #47 ASM McLaren: Karim Ojjeh went in hard at Radillon, on the entry to Eau Rouge, scattering the constituent parts of his McLaren over the corner. 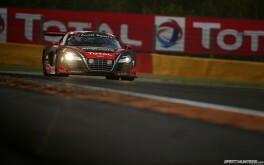 The car was predictably not out in the second session. After a quarter-hour clean-up the flags came in and track went green again – for about two minutes. 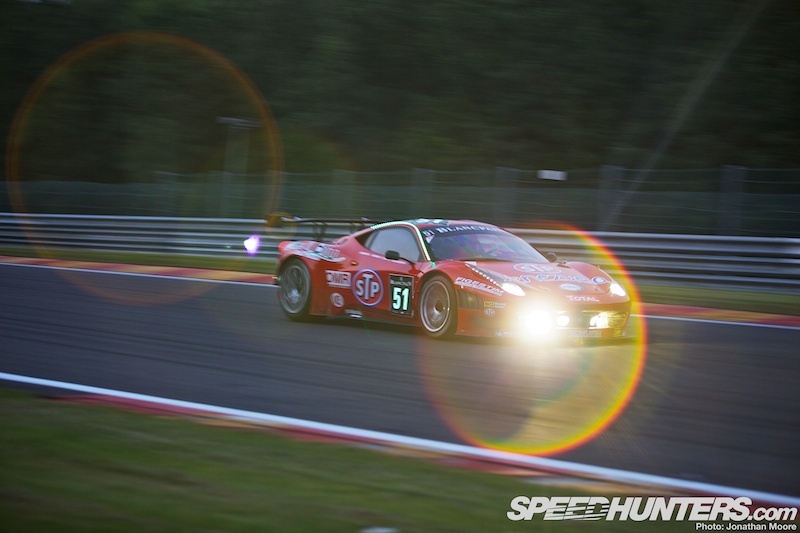 This time the cause had been less destructive: the #42 Sport Garage 458 had rolled to a halt around Blanchimont, requiring another brief period of red whilst the Ferrari was pushed out of the way. 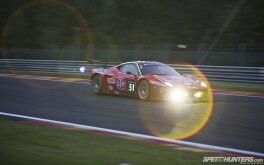 Darkness fell good and properly for the second part of Qualifying. 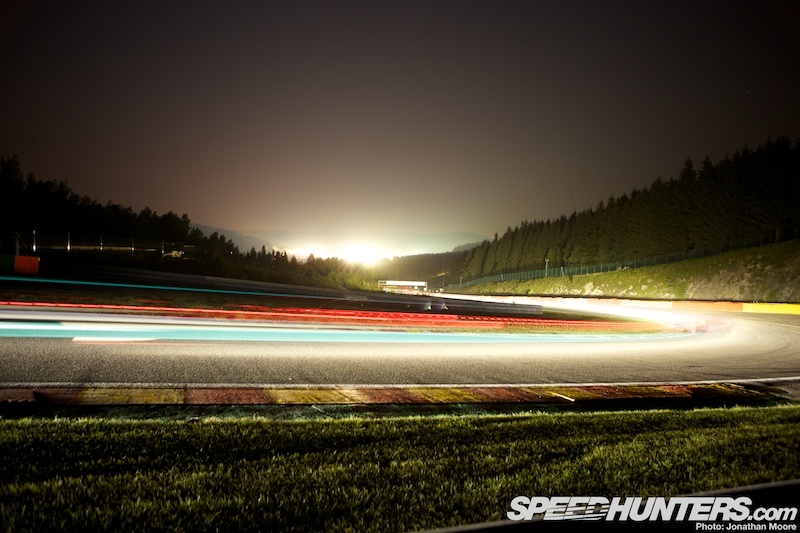 After a half an hour of R&R on the inside of the exit of Les Combes the circuit PA crackled into life and the marshals got back into position as the sound of engines echoed up the straight and the first cars burst into view. 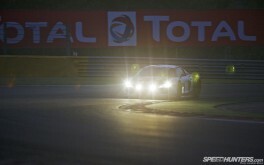 It’s pitch black up at the top end of the track. 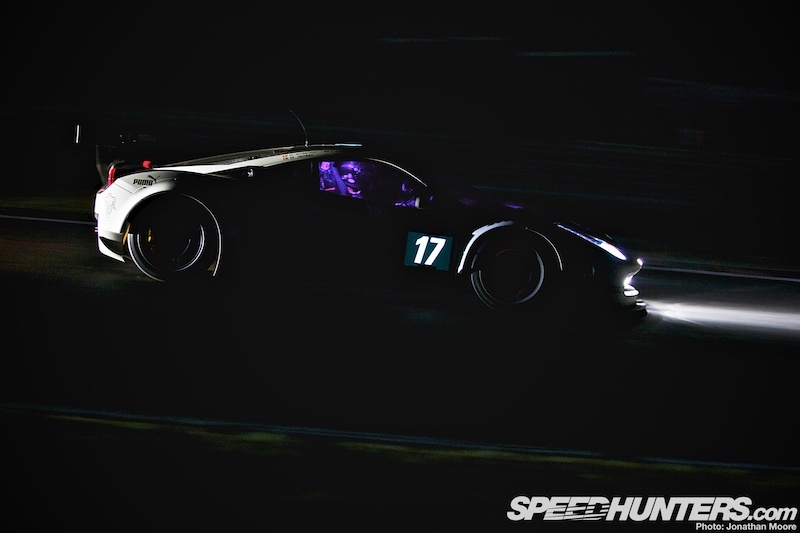 Fires and lamps in the campsites are the only sources of external light, so the track is utterly dark until pierced by the blinding headlights of the GTs. 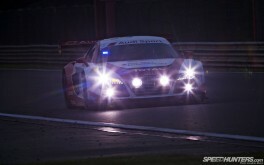 Though mostly you could only really see when the cars were illuminated by someone following close behind. 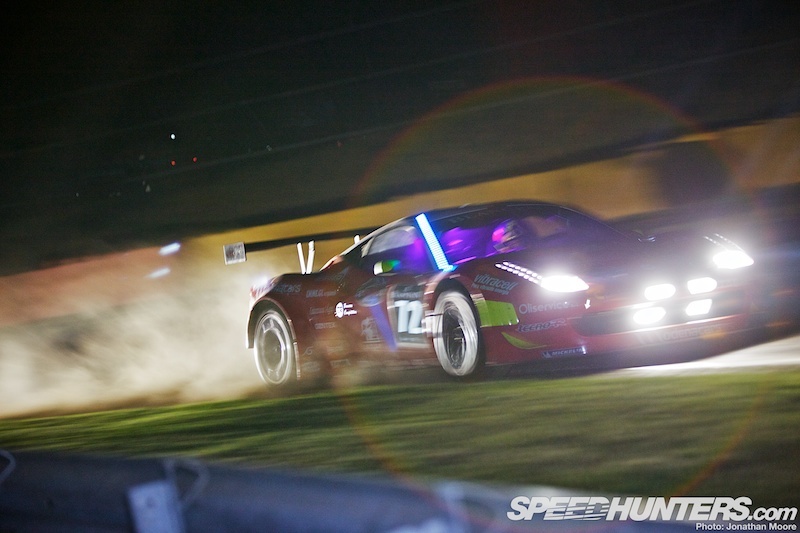 Still the cars fired round at maximum velocity, with their headlights making laser beams through the dust. Further round the track Pouhon was no better. Even here dust danced in beams of headlights. By this time my eyes were ready to explode from looking through a viewfinder at bright-as-day headlights strobing in and out of view. This was pretty much how I was seeing things. At least it was quite pretty. So, qualifying. The times that would end up setting the grid were all posted in the first session: Frank Kechele in the #66 Vita4One BMW Z4 set his fastest time just before the red flags, and it was good enough to stand as the top time across both sessions. 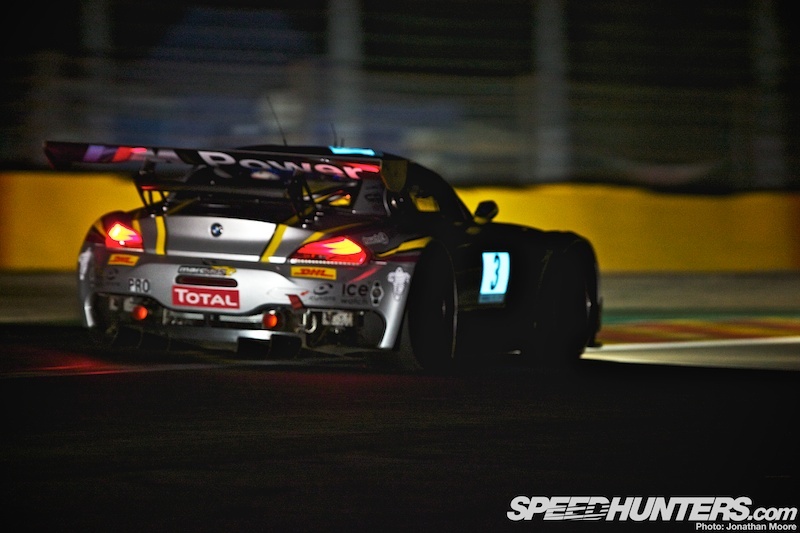 Next up was the #3 Marc VDS BMW, twice winners already this year, just 0.079s seconds behind the Vita4One Z4, making it two Pro cars at the top. However, they have a stop and go penalty to take within the first three laps of the race, after being one of a number of cars judged to have exceeded the track limits during Practice and Pre-Qualifying. 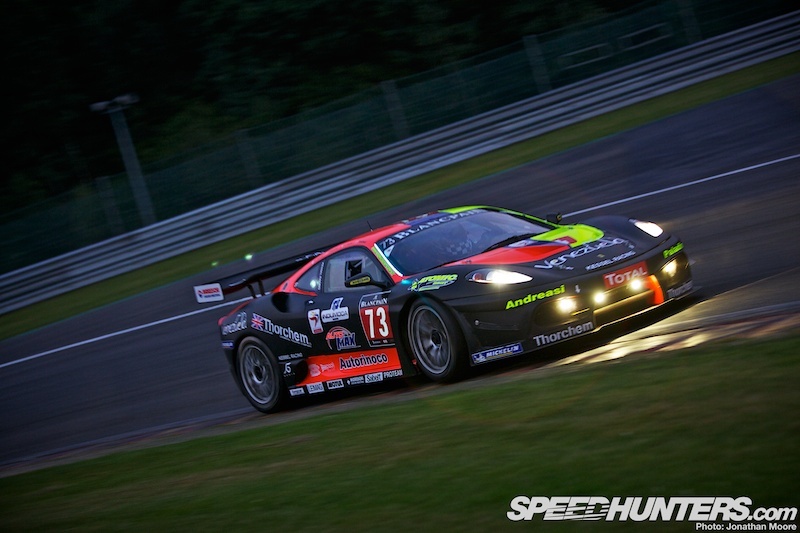 The highest-placed Pro-Am car was the #88 Von Ryan McLaren, which continued its strong form with a 2:19.729s lap, placing it third, just ahead of the #1 WRT Audi. A strong performance was put in by the British privateers in the #90 Preci-Spark Mercedes-Benz SLS: bolstered by multiple DTM Champion Bernd Schneider the quartet posted the 14th fastest time. After that positive Pre-Qualifying things rather fell apart for Edward’s crew in the #2 WRT Audi: they just couldn’t find space in Q1 after going out late in the session. 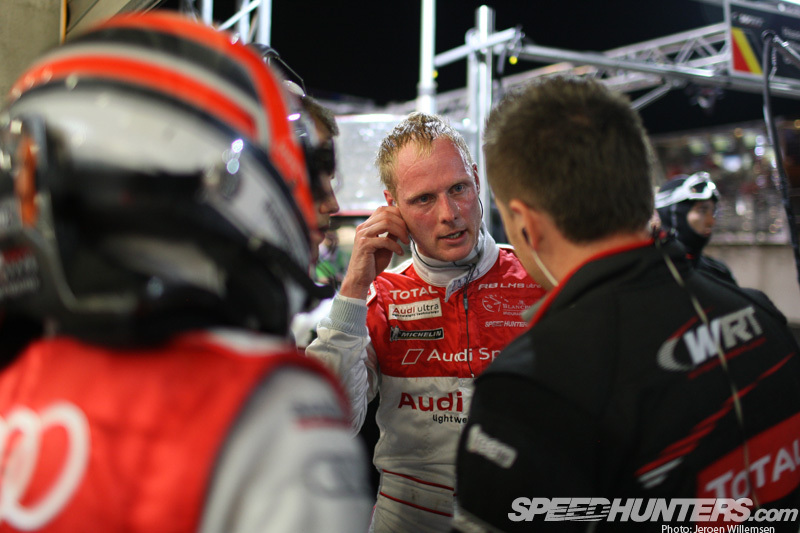 The red flags made the situation worse, and while back in the pits the crew looked on nervously #2 continued a last-ditch effort to break into the top 20. It didn’t work: they would finish only 21st quickest in Q1. Even though they subsequently went third quickest in Q2, the times were that much slower in the second session and they stayed 21st, meaning they would have missed out on the Super Pole session and the chance to improve had it gone ahead. 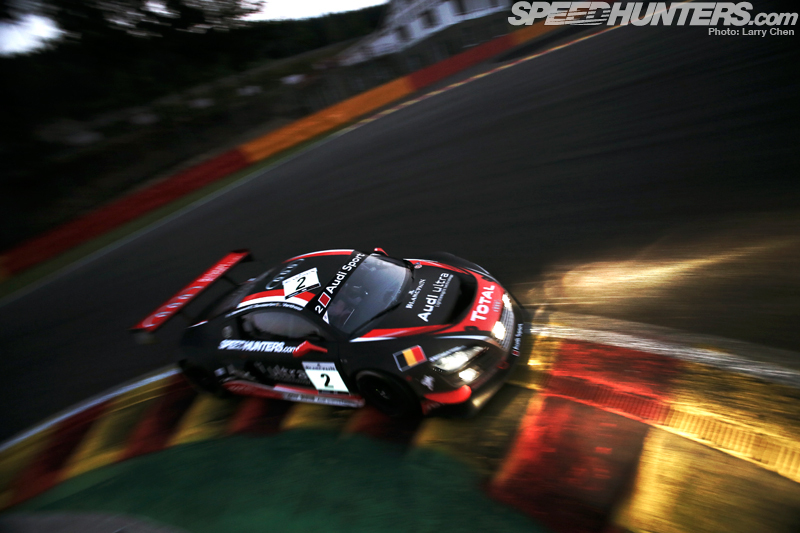 Here is WRT’s video update following qualifying. 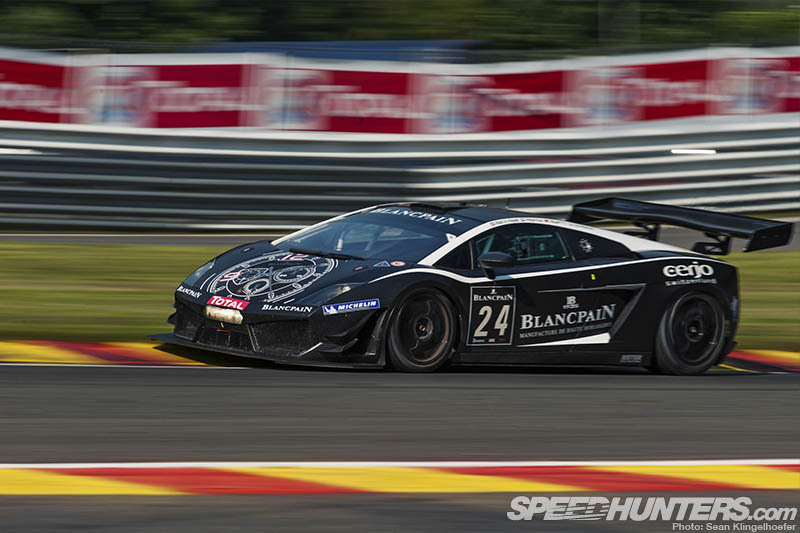 Of the single-car entrants the top runner was the Reiter Lamborghini – fast as usual. #24 lines up seventh. 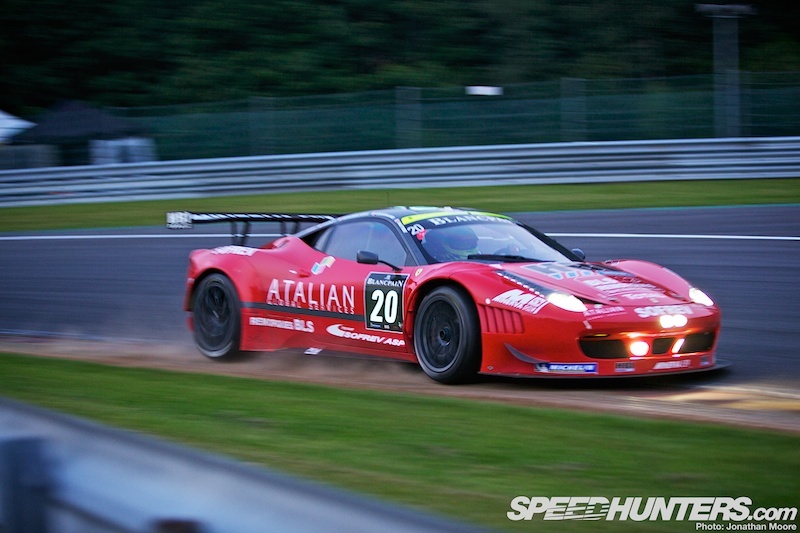 The #73 Ferrari 430 running in the Gentlemen Trophy class had monstered a lap in Pre-Qualifying to put it in 25th position, 23 positions and three seconds up on the second-fastest car in that class, but despite improving their time by over a second Q1 they still ended up 44th when the times were combined. 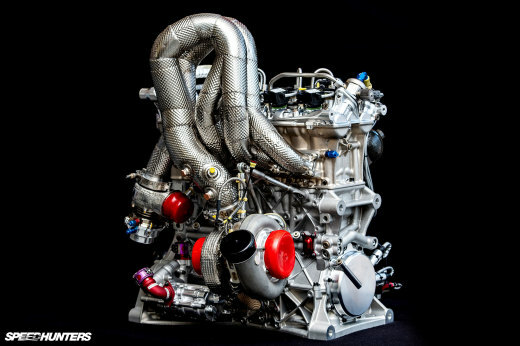 This was still an impressive result, and the 430 is likely to be bulletproof in the race. 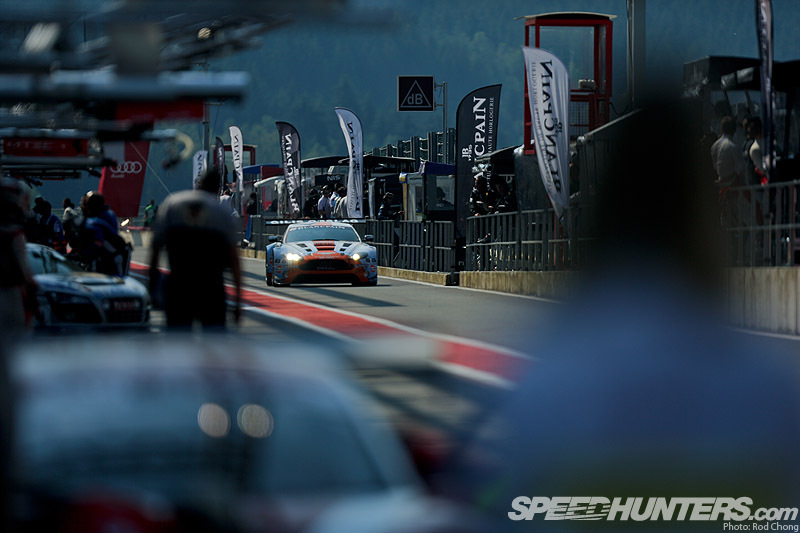 The quickest Aston Martin V12 Vantage GT3 starts in an impressive 10th. 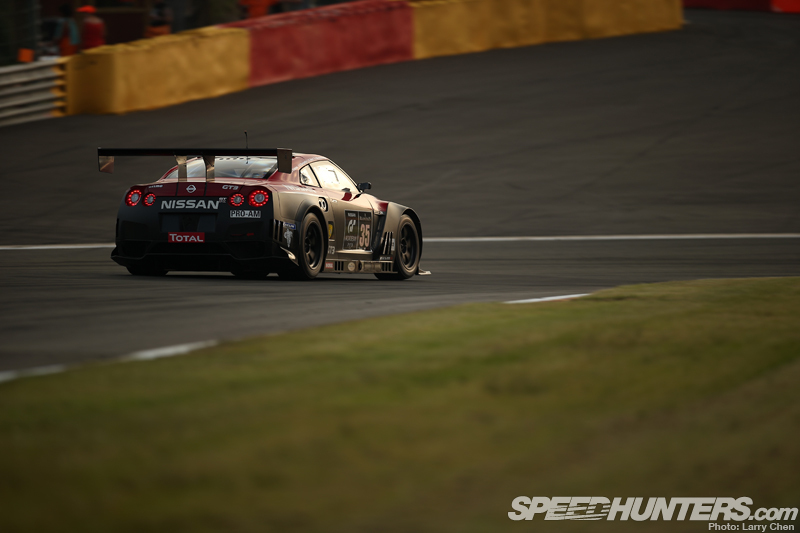 The Nissan GT-R starts in 41st, the Jaguar further back in 57th. 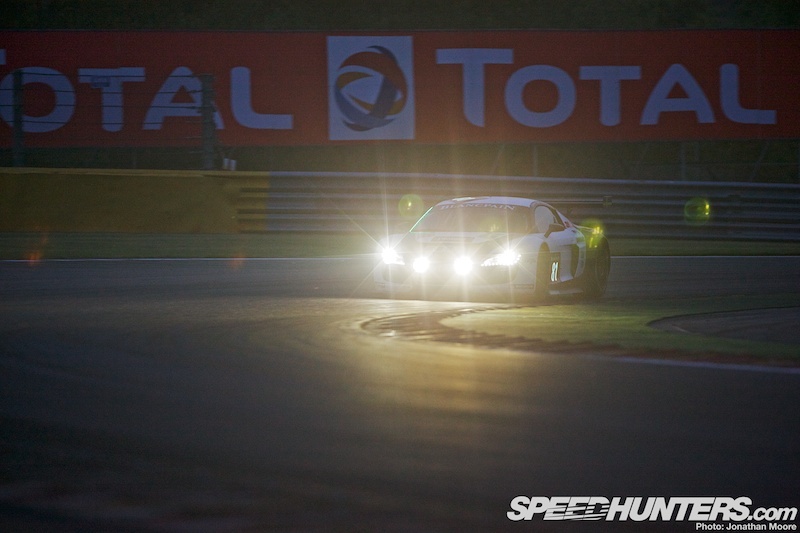 However, with a 24-hour race the starting position is rarely important: it’s more about bragging rights. It’s what happens in the 23 hours 59 minutes following the start that matter. With the top 13 qualifying within a second of each other and the top 26 within just two seconds, it gives you a good idea of how tight this race will once again be. Points will be scored at the six, 12 and 24 hour mark, so they’ll be all-out war right from the off to score those vital extra points at the early stages. 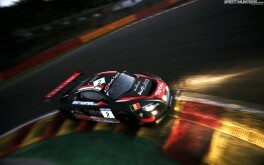 Spa is hands down the most awesome racetrack in the world. Can you post the results in future articles. Many posts have great coverage, but none of them have the final results to see where those that aren't listed stack up. I've often read an article, then had to go searching to find the results elsewhere. 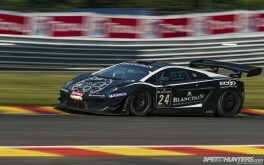 good to hear mclarens are running fast. those are some fine looking machines.